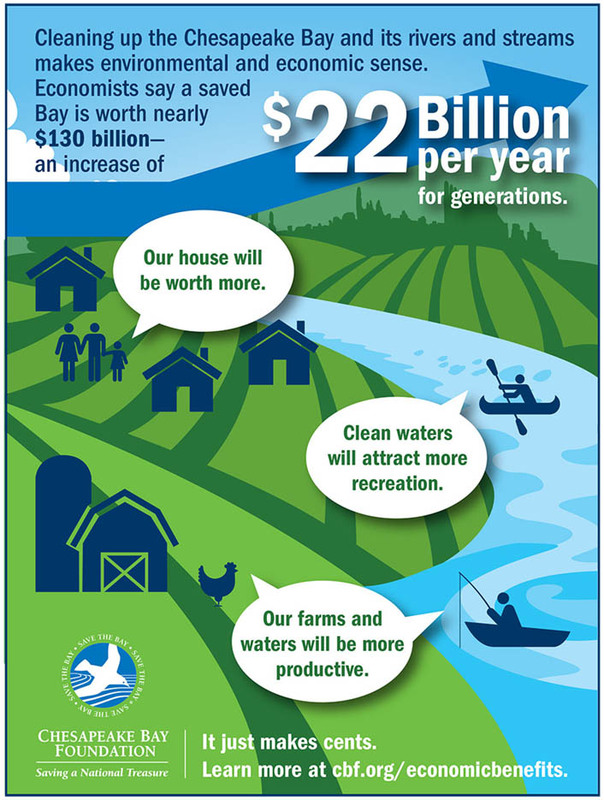 This first-ever analysis released by the Chesapeake Bay Foundation (CBF) finds that the economic benefits provided by nature in the Chesapeake Bay watershed will total $130 billion annually when the Chesapeake Clean Water Blueprint is fully implemented. 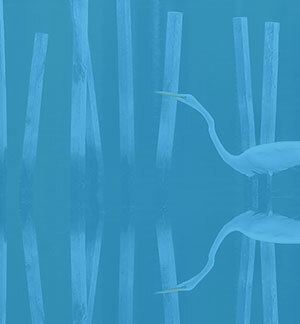 The peer-reviewed economic report, produced by economist Spencer Phillips and CBF Senior Scientist Dr. Beth McGee, compares the value of those benefits in 2009, the year before the Chesapeake Clean Water Blueprint began being implemented, to the benefits that can be expected as a result of fully implementing the Blueprint. In 2009 (before the Blueprint) the lands and waters of the Chesapeake Bay Region provided economic benefits totaling $107.2 billion annually. These benefits include air and water filtering, agricultural and seafood production, enhancement of property values, and protection from floods and hurricanes. Fully implementing the Blueprint is a big job. It requires the commitment, time, and resources of many sectors of our society and to some extent, every individual in the watershed. According to this peer-reviewed economic report, The Economic Benefits of the Chesapeake Clean Water Blueprint, it will be tremendous. The value of these same benefits will increase by $22.5 billion for a total of $129.7 billion annually if the Blueprint is implemented. Once fully realized, those benefits would accrue year after year. If the Blueprint is not fully implemented pollution loads will increase and the value of the natural benefits will decline by $5.6 billion, bringing the total down to $101.5 billion annually. Our lands, waters, and associated plants and animals provide natural benefits that economists call ecosysem services. People depend on them to sustain and enhance life. These benefits include life-supporting processes such as water and air purification, flood protection, and food production. They include life-enhancing assets such as beautiful places to recreate and live. Influence of land cover and biologically mediated processes on maintaining a favorable climate, promoting human health, crop productivity, recreation, and other services. The harvest of agricultural produce, including crops, livestock, and livestock by-products; the food value of hunting, fishing, etc. ; and the value of wild-caught and aquaculture-produced fin fish and shellfish. Modulation by land cover of the timing of runoff and river discharge, resulting in less severe drought, flooding, and other consequences of too much or too little water available at the wrong time or place. The role that beautiful, healthy natural areas play in attracting people to live, work, and recreate in a region; often reflected in property values. Removal or breakdown of nutrient pollution and other chemicals by vegetation, microbes, and other organisms, resulting in fewer, less toxic, and/or lower volumes of pollutants in the system. The availability of a variety of safe and pleasant landscapes—such as clean water and healthy shorelines—that encourage ecotourism, outdoor sports, fishing, wildlife watching, etc. Filtering, retention, storage, and delivery of fresh water—both quality and quantity—for drinking, irrigation, industrial processes, and other uses. What Does That Mean for the States? With implementation of the Blueprint, each of the states in the watershed will see substantially enhanced benefits. In all cases, forests generated the largest values, because more than half (55 percent) of the watershed is forested and because the services they provide—filtering drinking water, reducing flooding, providing recreation and beauty—are highly valued. Full implementation of the Blueprint makes good economic and environmental sense!